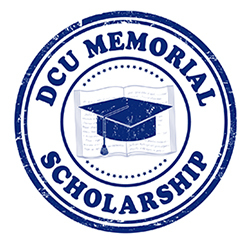 For over 20 years, DCU has provided a scholarship program designed to assist students in the pursuit of a higher education with nearly $900,000 in scholarships being awarded. Annually, DCU for Kids will award up to 90 scholarships totaling approximately $165,000 to graduating high school seniors judged most likely to excel at a college or university. Recipients are chosen by an impartial panel of college educators who base their decisions on scholastic achievement, community involvement, leadership skills, character and integrity, recommendation letters, as well as an essay submitted by the student. The Annual Scholarship Program will accept applications starting Friday, December 7, 2018 until Friday, March 1, 2019 - 3pm EST. Please review the Official Rules and FAQ’s before submitting your online application. Please review the official rules, how to apply, and past winners at www.dcuforkids.org.